When I made the Cindy blouse cover garment I really wanted to use the collar that matched the decorative front panel, so I did. of the Paganoonoo upcycle Patti Blouse Pattern. BLOG POST: New Pattern! Double collar instructions. 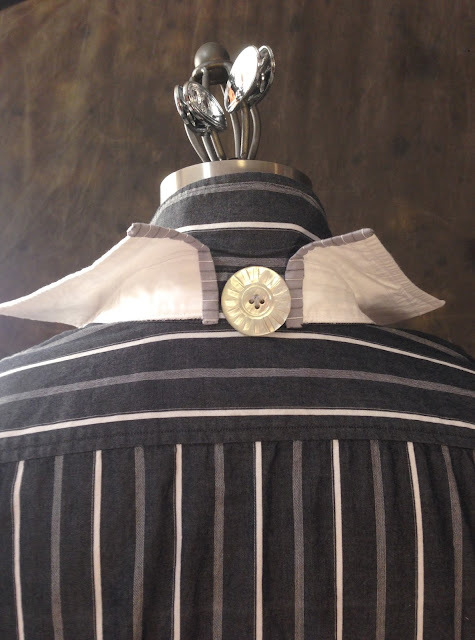 Adding a double collar to an existing shirt gives it instant flair! Take the guesswork out of the equation and save yourself time and aggravation. Leverage upcycler fashion designer Michelle Paganini’s proven methods. This Paganoonoo pattern will guide you through every step of harvesting a collar from and existing shirt and transferring it successfully to a new shirt. Includes instructions for mismatched collar sizes. BLOG POST: Paganoonoo on It’s Sew Easy!!! Hello! It’s been quite a while since I posted and there is all kinds of great news. Michelle was invited to appear on It’s Sew Easy and she answered with a resounding yes! She flew to Solon, Ohio in January and filmed 5 different segments on upcycling (her favorite topic! ), 4 of which appear in series 1300 and one that will air in series 1400.